Sugar cane is such a delicious snack, in Thailand it's eaten as a snack like peanuts or sunflower seeds are consumed in America. At sporting events or old outdoor movie theaters you'll see people biting into the cane, chewing up and spitting out the woody part. This canned sugarcane is even better than fresh-harvest raw sugarcane, because it's packed in water which softens it up a bit. It tastes just like fresh sugarcane though, remarkable flavor. A delicious way to cook with sugarcane: see our recipe for Thai sugarcane prawns. This is a large, long can weighing more than 2.5 lbs. 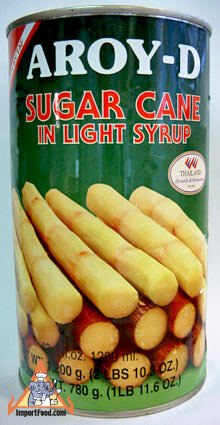 Each cane is 5-6" long, and you get 10 or 12 canes per can. Ingredients: sugar cane, water, citric acid. Product of Thailand.